Join us tomorrow for four more Premiership games in the winter wonderland of a Scottish January. With Aberdeen inactive, Celtic can regain the lead at the top should they defeat struggling Motherwell, while St Mirren host Dundee United, Hamilton Accies travel to take on Partick Thistle, while Kilmarnock are in Dundee. Thanks for your company tonight. St Johnstone, who face leaders Aberdeen on Friday night with injury problems mounting, remain seven points behind Hamilton Accies in sixth. Kilmarnock have the chance to narrow the gap with Saints to two points should they defeat Dundee at Dens Park tomorrow night. That's the first time Caley Thistle have recorded four successive league wins since May 2011. Caley Thistle's star striker, Billy McKay, is out of contract in the summer and manager John Hughes was asked if there was any chance of the Northern Ireland international signing a new contract. "I very much doubt it," he said. "He has been a wonderful player since I came here. "He is out of contract and, if another team is doubling his wages, we can't match that. "If Billy does more on, he will go with our best wishes and, if he goes to the English Championship or somewhere, he deserves it." "Overall, we didn't do enough in terms of getting close to them. "The first goal was shambolic and the second one we were totally disorganised. "There were things we would have done to stop them that we didn't do. "The back four were fine. It was those in front of them who didn't do their jobs. "It is only our third defeat in 12 games, but we're hurting tonight." "The boys have been different class. It started first day of pre-season. "We played some real wonderful football tonight and on another night we might have scored more goals, but I'll settle for a clean sheet and 2-0. "We really work hard on the training pitch and I want to see it put into fruition." Caley Thistle are now only one point behind Celtic and three adrift of Premiership leaders Aberdeen. An impressive run. "We've got to give Inverness great credit. Their movement off and on the ball was exceptional and caused them no end of problems. It could and should have been more." "That was as comfortable as it comes. Caley Thistle played the game like a team at the top of the league. St Johnstone, I'm afraid to say, were the total opposite and lacked in many departments." A convincing victory for Caley Thistle moves John Hughes' side on to the 44-point mark and into third place in the Scottish Premiership. leapfrogging Dundee United. Caley Thistle defender Carl Tremarco breaks once more and tries to square the ball for substitute Alasdair Sutherland, but goalkeeper Alan Mannus does well to intercept. The attendance tonight at Caledonian Stadium is 3,161, which is not bad on a bitterly cold January evening in Inverness. But one shudders (and not just because of the weather conditions) to think what it might have been if that "pay what you can" offer was not in operation. Time is rapidly running out for St Johnstone, with Caley Thistle completely in control and taking the pace out of the game. BBC Radio Scotland commentator Scott Davie is pointing out that, even if they lose tonight, St Johnstone are five points better off than they were at this stage last season - and that was before Scotland striker Stevie May headed for Sheffield Wednesday! Ryan Christie has also come on for Marley Watkins and the talented young midfielder has already been involved in a few Caley Thistle attacks. By the way, I missed out telling you that Gary Miller had come on for the injured Frazer Wright in the Saints defence. That's Tommy Wright used all his substitutes. Gary Miller misses a rare chance for St Johnstone as he fires over the crossbar. Andrew Priestley: "St Johnstone have been so inconsistent since Stevie May left in the summer. They're back to mid-table mediocrity again." Ross Gillespie: "I'm a big Inverness fan, the atmospheres lately have been poor. Hopefully this experiment will make that change." "It is like a training game. It is waves of attack by Inverness in the second half." "They are struggling to get out are St Johnstone and they are picking the wrong passes to have any meaningful attack." A fine display of attacking passing almost ends with a third goal for Caley Thisle as Aaron Doran's shot is saved by goalkeeper Alan Mannus and Billy McKay's attempt to score with the rebound is deflected over the crossbar. It seems like defender Frazer Wright is struggling with a knock. Problems piling up for St Johnstone manager Tommy Wright, who has already made two changes. Another change by St Johnstone manager Tommy Wright, with Gary McDonald coming on for Scott Brown in midfield. Can it change the course of the game? Stephen Collins: "The 'pay what you can' scheme at Inverness CT is inspired. Irish league & FA league 1&2 should try it. Footy for the people." "After the first five minutes, it's been men against boys." "I have been a bit disappointed with St Johnstone. They don't look they have any ambition to get up the pitch." Having set up the second goal, defender Carl Tremarco strides forward and fires a shot just wide. Carl Tremarco shows great persistence to get to the by-line and, when Saints goalkeeper Alan Mannus fails to deal with the cross, Marley Watkins is there to apply the finish. Billy McKay pounces for his fifth goal in four games after St Johnstone pay for a poor clearance and Graeme Shinnie's cross tees up the striker. St Johnstone, who already have a few injury problems to contend with, lose Michael O'Halloran, with the striker being replaced with Chris Kane. Caley Thistle winger Aaron Doran has scored some spectacular long-range goals, but this time he shoots well wide from 30 yards. However,, it almost turned into a good pass, with team-mate Billy McKay just failing to connect in front of goal. "I would have thought that St Johnstone would have defended better than this. It is only 19 minutes and they've given Inverness three clear-cut chances." A superb stop from Alan Manus as the St Johnstone goalkeeper holds a fine downward header from Billy McKay. Aaron Doran fires wide after Billy McKay shot flies across the face of the St Johnstone goal. A bad miss by the winger, who should have at least hit the target. "St Johnstone are beginning to turn the screw. They are going for a more direct approach and it has almost paid off." St Johnstone defender Steven Anderson scoops the ball away after goalkeeper Alan Manus fails to hold Danny Williams' powerful shot. Manus would have done better to turn that wide instead of straight in front of himself, where the dangerous Billy Mckay was lurking. Caley Thistle's Graeme Shinnie, who is playing at right-back tonight in place of suspended David Raven, sticks his left foot out and awkwardly sends the ball off his shin and over his own crossbar for a corner. The last game between the sides ended with St Johnstone striker Brian Graham scoring a controversial winner, the striker winning the penalty himself, scoring with the spot kick and then being banned for simulation. The players have emerged from the tunnel onto the park. A few minutes from kick-off now. Andrew Priestley: "Yet another crisis at Rangers Football Club after last night's latest resignation. When will it all end?" I am sure even Rangers themselves don't have an answer to that one. Any fortune tellers out there? Apparently the first St Johnstone fan to arrive at Caledonian Thistle paid £30 for entry because he thought the "pay what you can" scheme was such a great idea. Is that just because Saints fans are posh? Give us your thoughts on Twitter or on our Facebook page. "Three games in six days is difficult and we're fortunate we can change it. "It is always a difficult place to play, but we can take heart from out last game against them. "We have had two defeats in 10 and we did that by going back to basics and being hard to beat. "We are getting things right defensively and I think we will improve on the goalscoring front." St Johnstone manager Tommy Wright has decided to make three changes as his squad face another game on Friday evening. Midfielder Chris Millar, striker Steven MacLean and full-back Brian Easton are rested, with Tam Scobbie, Brian Graham and Scott Brown coming into the starting line-up. Inverness manager John Hughes has been forced into two changes from the side that beat Kilmarnock. David Raven and Greg Tansey both miss out through suspension, with Danny Williams and Marley Watkins coming into the starting line-up, while teenage striker Alasdair Sutherland earns a place on the bench. Caley Thistle have beaten Saints on the Perth side's last three visits to Caledonian Stadium and St Johnstone have not won there on their last six trips to Inverness. Tonight's sides have had one win each in their meetings this season, with Saints edging their last meeting 1-0 at McDiarmid Park just before Xmas. 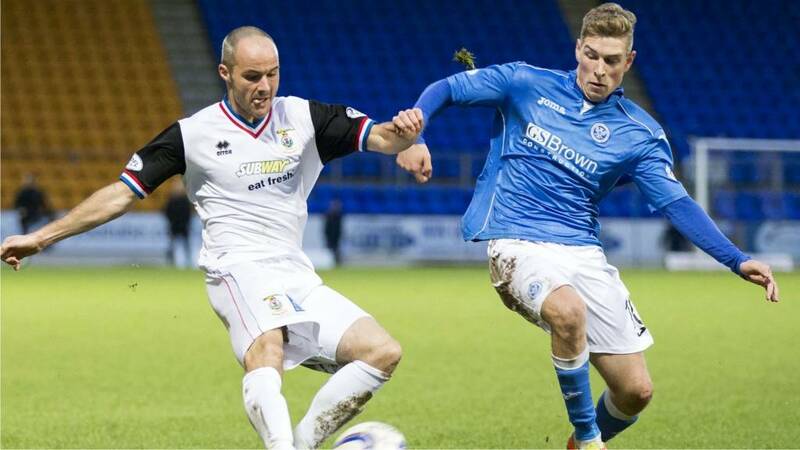 St Johnstone got back on track after two consecutive defeats by beating Partick Thistle 2-0 at the weekend. So both sides are on a high and that hopefully means an exciting contest at Caledonian Stadium. Inverness are looking for a fourth straight win after a fine 2-1 success away to Kilmarnock at the weekend. Inverness CT: Brill, Shinnie, Warren, Meekings, Tremarco, Watkins, Draper, Williams, Doran, Ross, McKay. Subs: Esson, Vincent, Devine, Horner, Polworth, Christie, Sutherland. St Johnstone: Mannus, Mackay, Anderson, Wright, Scobbie, O'Halloran, Brown, Lappin, Caddis, Wotherspoon, Graham. Subs: McDonald, MacLean, Banks, Miller, Croft, Easton, Kane. What do you think of the "pay what you can" experiment? Give us your thoughts on that and any other issues this week in Scottish football. Almost as much as the result, it will be interesting to note the size of the crowd as Caley Thistle experiment with a "pay what you can" policy for fans at the gates. It is something tried with some success by Albion Rovers in League Two, but how will it fare in the Premiership? Welcome to our live text coverage of tonight's Scottish Premiership game between Inverness Caledonian Thistle and St Johnstone.